Antoinette Burton focuses on the experiences of three Victorian travelers in Britain to illustrate how "Englishness" was made and remade in relation to imperialism. The accounts left by these three sojourners—all prominent, educated Indians—represent complex, critical ethnographies of "native" metropolitan society and offer revealing glimpses of what it was like to be a colonial subject in fin-de-siècle Britain. Burton's innovative interpretation of the travelers' testimonies shatters the myth of Britain's insularity from its own construction of empire and shows that it was instead a terrain open to continual contest and refiguration. Burton's three subjects felt the influence of imperial power keenly during even the most everyday encounters in Britain. Pandita Ramabai arrived in London in 1883 seeking a medical education and left in 1886, having resisted the Anglican Church's attempts to make her an evangelical missionary. Cornelia Sorabji went to Oxford to study law and became the first Indian woman to be called to the Bar. Behramji Malabari sought help for his Indian reform projects in England, and subjected London to colonial scrutiny in the process. Their experiences form the basis of this wide-ranging, clearly written, and imaginative investigation of diasporic movement in the colonial metropolis. 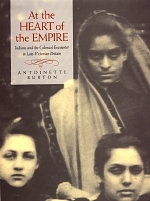 Antoinette Burton is a historian of 19th and 20th century Britain and its empire. She teaches at the University of Illinois, Urbana-Champaign, where she is Bastian Professor of Global and Transnational Studies. Trained as a Victorianist, she has written on topics ranging from feminism and colonialism to the relationship of empire to the nation and the world. The recipient of a John Simon Guggenheim fellowship in 2010-11, she is currently engaged in a comprehensive study of empire on the ground in the 19th century.